A new result from the Q-weak experiment at the Department of Energy's Thomas Jefferson National Accelerator Facility provides a precision test of the weak force, one of four fundamental forces in nature. This result, published recently in Nature, also constrains possibilities for new particles and forces beyond our present knowledge. "Precision measurements like this one can act as windows into a world of potential new particles that otherwise might only be observable using extremely high-energy accelerators that are currently beyond the reach of our technical capabilities," said Roger Carlini, a Jefferson Lab scientist and a co-spokesperson for the Q-weak Collaboration. While the weak force is difficult to observe directly, its influence can be felt in our everyday world. For example, it initiates the chain of reactions that power the sun and it provides a mechanism for radioactive decays that partially heat the Earth's core and that also enable doctors to detect disease inside the body without surgery. Now, the Q-weak Collaboration has revealed one of the weak force's secrets: the precise strength of its grip on the proton. 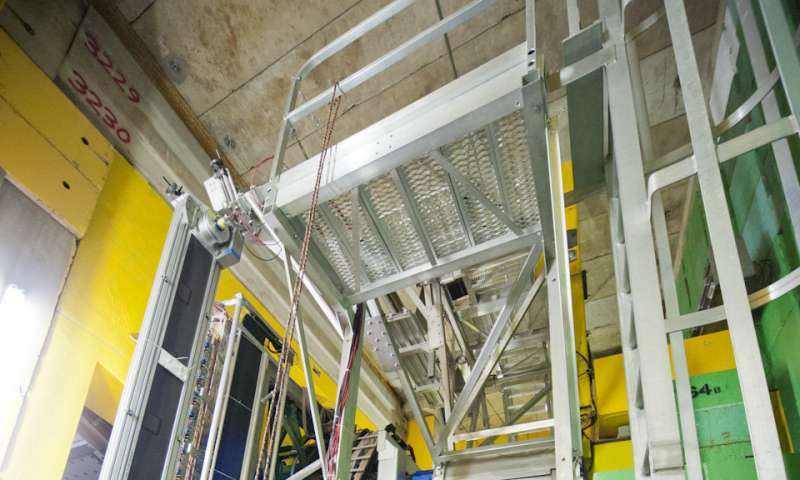 They did this by measuring the proton's weak charge to high precision, which they probed using the high-quality beams available at the Continuous Electron Beam Accelerator Facility, a DOE Office of Science User Facility. The proton's weak charge is analogous to its more familiar electric charge, a measure of the influence the proton experiences from the electromagnetic force. These two interactions are closely related in the Standard Model, a highly successful theory that describes the electromagnetic and weak forces as two different aspects of a single force that interacts with subatomic particles. To measure the proton's weak charge, an intense beam of electrons was directed onto a target containing cold liquid hydrogen, and the electrons scattered from this target were detected in a precise, custom-built measuring apparatus. The key to the Q-weak experiment is that the electrons in the beam were highly polarized - prepared prior to acceleration to be mostly "spinning" in one direction, parallel or anti-parallel to the beamdirection. With the direction of polarization rapidly reversed in a controlled manner, the experimenters were able to latch onto the weak interaction's unique property of parity (akin to mirror symmetry) violation, in order to isolate its tiny effects to high precision: a different scattering rate by about 2 parts in 10 million was measured for the two beam polarization states. The proton's weak charge was found to be QWp=0.0719±0.0045, which turns out to be in excellent agreement with predictions of the Standard Model, which takes into account all known subatomic particles and the forces that act on them. Because the proton's weak charge is so precisely predicted in this model, the new Q-weak result provides insight into predictions of hitherto unobserved heavy particles, such as those that may be produced by the Large Hadron Collider (LHC) at CERN in Europe or future high energy particle accelerators. "This very challenging experimental result is yet another clue in the world-wide search for new physics beyond our current understanding. There is ample evidence the Standard Model of Particle physics provides only an incomplete description of nature's phenomena, but where the breakthrough will come remains elusive," said Timothy J. Hallman, Associate Director for Nuclear Physics of the Department of Energy Office of Science. "Experiments like Q-weak are pressing ever closer to finding the answer." For example, the Q-weak result has set limits on the possible existence of leptoquarks, which are hypothetical particles that can reverse the identities of two broad classes of very different fundamental particles - turning quarks (the building blocks of nuclear matter) into leptons (electrons and their heavier counterparts) and vice versa. "After more than a decade of careful work, Q-weak not only informed the Standard Model, it showed that extreme precision can enable moderate-energy experiments to achieve results on par with the largest accelerators available to science," said Anne Kinney, Assistant Director for the Mathematical and Physical Sciences Directorate at the National Science Foundation. "Such precision will be important in the hunt for physics beyond the Standard Model, where new particle effects would likely appear as extremely tiny deviations." "It's complementary information. So, if they find evidence for new physics in the future at the LHC, we can help identify what it might be, from the limits that we're setting already in this paper," said Greg Smith, Jefferson Lab scientist and Q-weak project manager.